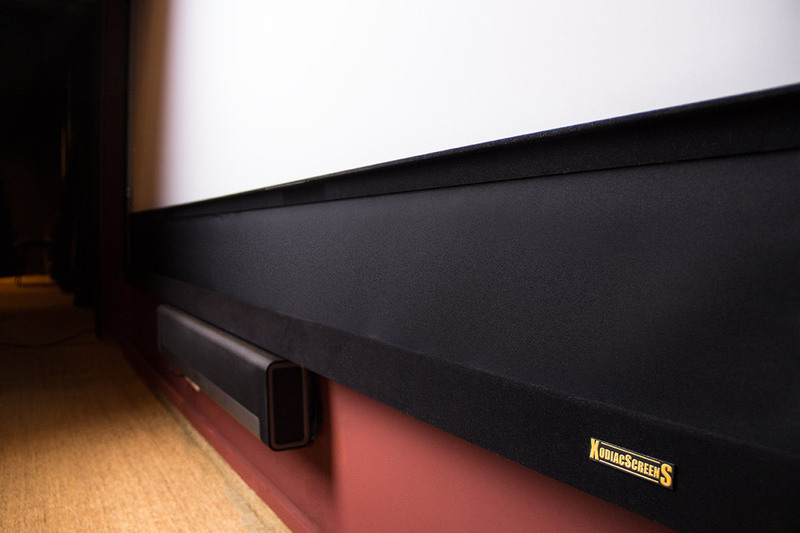 A home cinema projection screen is just as essential for a successful home theatre experience as the AV receiver or the projector though nevertheless the issue of the screen often falls by the way side. On the other hand absolutely understandable – the attention-grabbing technical innovations take place generally in other fields – is this circumstance on the other hand completely in contrast to the fact that the screen is the most studied and best, the only brightly lit space in the home theater later. Errors in the processing being every time anew mercilessly and not only that: The screen determined quite the quality of the displayed image decisively with. There are plenty of reasons to consider this topic in more detail. The ideal screen has an extremely fine projection, reflecting possible neutral colours, is adaptable to different screen dimensions and, at best, absolutely flat, so that the projected image is displayed without artifacts completely and faithfully. While the theory is quasi abzuhandeln in one sentence, it is in practice, however, quickly become complex: There are a number of different screen types that carry different needs into account and our Ideal come close accordingly different. To keep track of things, we will first present the most important types. Then we go into more detail and look at specific features that need to be aware of it when choosing a suitable canvas. We begin with the typical tripod screens that can be opened as needed and let reassemble. This option seems at first practical and particular interest when for example, the living room is to be only occasionally turned into a home theater. In favor of increased mobility, however, compromising the construction are unavoidable, the mechanisms are often less stable and the cloths used thinner than fixed solutions. This in turn has consequences for the image quality, which is due to the insufficient tighten projection and the favorable reflection properties often reduced significantly. 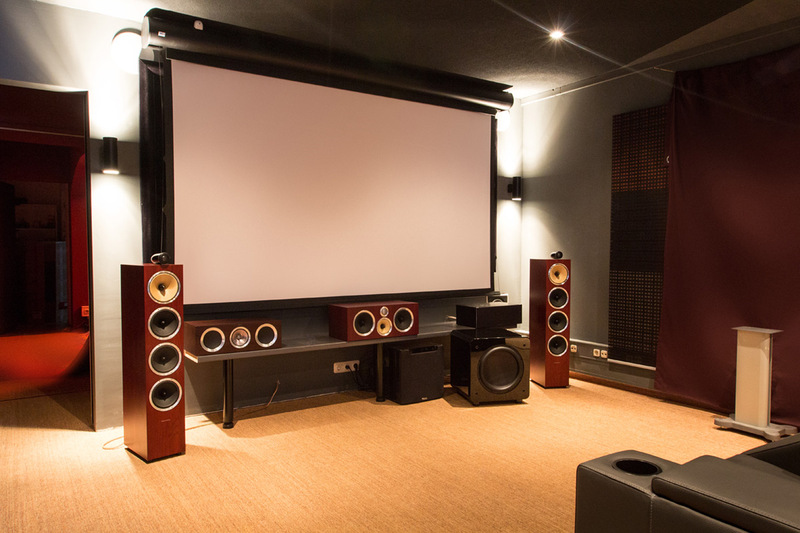 Apart from the construction and dismantling procedure can be quite tedious, leaving long traces on the screen, so we can hardly recommend this solution for home theater applications basically depending on the size. Clearly suitable for this purpose are the so-called roll over motorised screens. While you yourself must lend a hand in rollo-screens, the latter being due to the motorization can of course be much more comfortable and can be optionally also in a comprehensive home automation integrated. Apart from that both versions work along the same principles. Similar to a blind is a rolling box to or installed in the ceiling and extended the projection surface when needed. 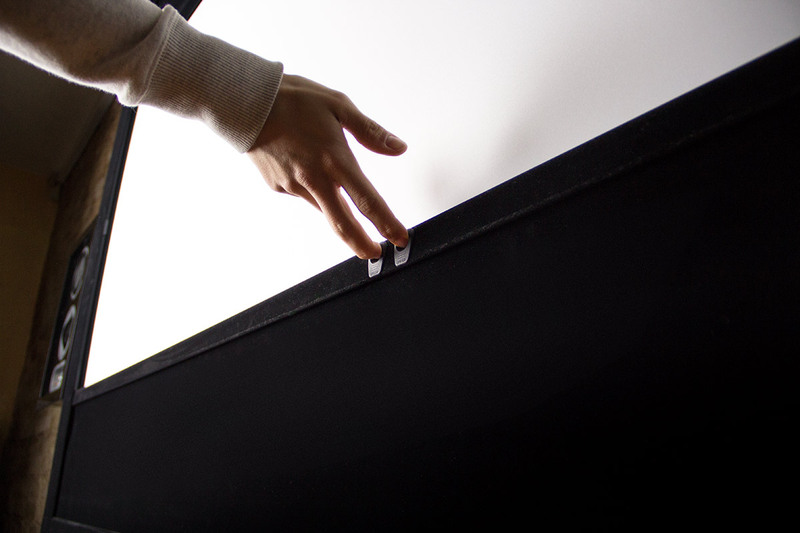 Rollover and motorized screens are less flexible than tripod screens, but allow at least to stow the projection surface easily and also provide design-related advantages: Since the aspect of mobility is no longer important here, the use of more stable mechanisms and strapazierfähigerer cloths with better reflective properties is nothing in the way. Many of the high quality electric screens await beyond special features that you are looking at Tripod screens usually in vain. Before we look at these special features and other aspects of the screen technology in detail, we first before the third and last major screen type. The so-called Frame Screens own – the name says it all – a rigid frame and can be neither assembled nor hide in a rolling box hence. Thus, they are of course by far the most inflexible and less high-tech than a sophisticated electric screen, but doing therefore very reliable service. The cloth is firmly clamped in the frame, thus absolutely flat. 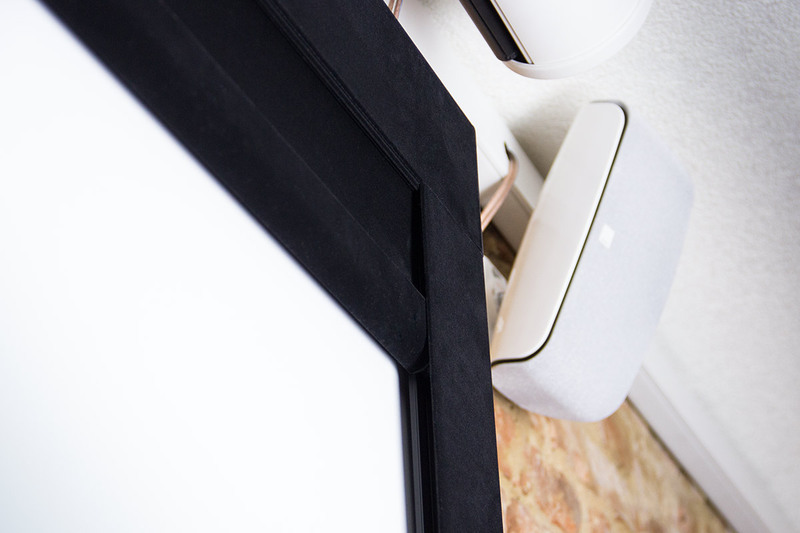 The jet black coating of velvet or velor limited the projected image clean at all sides. This is very pleasing to the eye, the contrast can act stronger and brings the total picture better advantage. Such a framing of the image, which is also found in some electric screens in the form of a black circulation, is also called in the jargon masking and ideally provides a canvas to the option to adjust flexibly to the image. 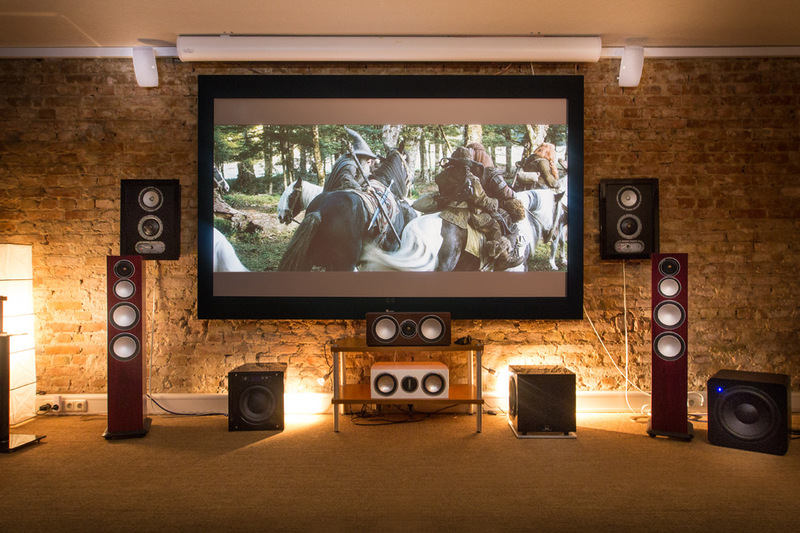 9 and 21: 16 – Here two main options are, of course, 9 – for home cinema fans particularly interesting. With dedicated multi-format screens also still are additional formats to choose from, so the benefits of a clear picture limitation described above are retained regardless of the source. Depending on the screen type, the adaptation to different image formats is solved differently. 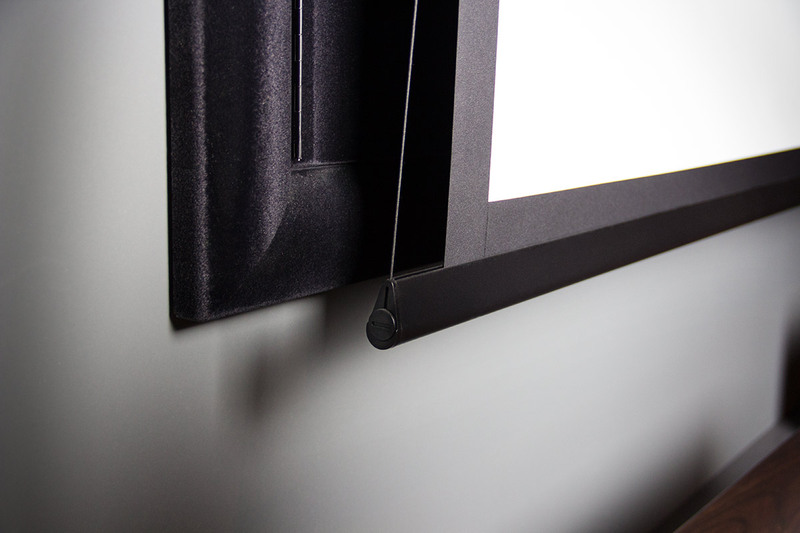 While Frame screens often offer the opportunity to align the masking on both sides vertically, change in engine screens usually on head pressure of lead (Black Drop) and the distance of the screen lower edge to the floor. Such a framing of the image, which is also found in some electric screens in the form of a black circulation, is also called in the jargon masking and ideally provides a canvas the option to adjust flexibly to the image. 9 and 21: 16 – Here two main options are, of course, 9 – for home cinema fans particularly interesting. With dedicated multi-format screens also still are additional formats to choose from, so the benefits of a clear picture limitation described above are retained regardless of the source. Depending on the screen type, the adaptation to different image formats is solved differently. While Frame screens often offer the opportunity to align the masking on both sides vertically, change in engine screens usually on head pressure of lead (Black Drop) and the distance of the screen lower edge to the floor. 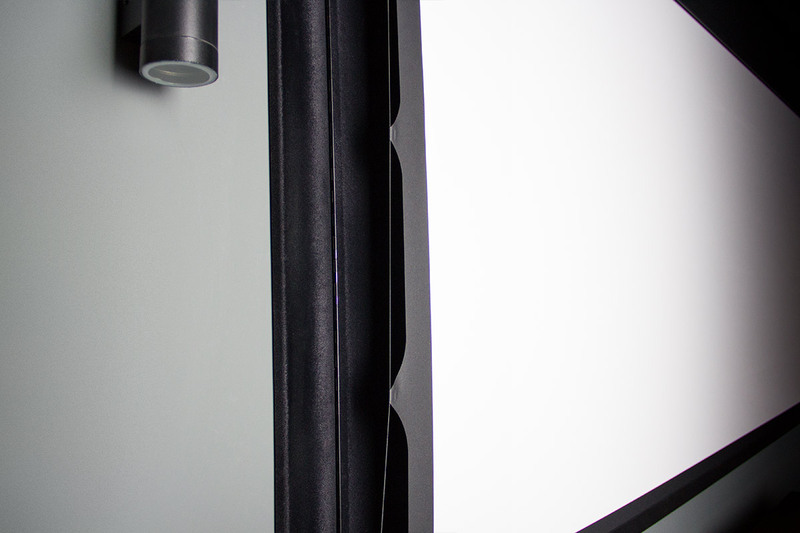 The projection surfaces themselves are often made of a material in fiber or vinyl base. You should be absolutely neutral in color, so that the image is not distorted and beyond have a black back to avoid possibly back rest light reflections. Furthermore, it is important to distinguish different types of towels, we restrict ourselves at this point on the two main variants. Diffuse radiating screens that operate under the banner “type D” or simply as “matt white”, reflect the incident light largely uniformly in all directions and are in most cases the first choice. In difficult lighting conditions is possibly also a reflective cloth “Type S” in question. It reflects the light back, thus ensuring bundled in a certain area in front of the screen for a more powerful image impression. However, this effect is achieved through a less uniform overall illumination and a limited viewing angle. Such wipes are also called “Gain towels”. This term refers to the so-called gain or luminance factor which expresses the amount of bundling in a numeric value. For orientation: The gain factor for a dull white, diffusely radiating cloth is 1.0, while Gain towels higher values ​​- are assigned – for example, 1.5. Finally, it is a special cloth variant mentioned. The acoustically transparent cloth has a perforated surface and allows the placement of speakers behind the screen without causing significant loss of sound. If necessary, it should be ensured that such a screen is in spite of the special structure able to reflect an image in 4K resolution. We have reached the end of our little survey about home theater screens. Although perhaps not the most exciting and is innovationsträchtigste field in the area of home theater electronics, it still worth some time in the search for “the right” to invest and to make his choice carefully. We rely on products from the manufacturer Visivo, WS-Spalluto and Xodiac and thus cover the entire spectrum of the presented screen types. We are happy to find in a personal conversation with you the solution that will suit your needs and the given building conditions on site requirements. Additionally, you can take in our home theater studios of course various models in inspection and testing.